In the era of the cloud and the Internet of Things, adaptive networks and insight-driven automation are crucial for managing traffic dynamics, optimizing resource utilization, and mitigating security threats. Fortunately, recent advances in routing silicon, such as Nokia FP4, offer a foundation for essential new capabilities. Real-time visibility and control can now be expanded to a powerful, network-wide level. And when enhanced packet intelligence is combined with network analytics, the network itself becomes part of the solution to today’s biggest challenges. Scaling challenges: Forecasters generally expect the number of devices connecting to the internet to reach 20 to 46 billion by 2020, up from 1.6 billion in 2014. Network operators are looking for the best ways to address this continued explosive growth — while supporting consumer applications that are increasingly dynamic and bandwidth sensitive. For instance, when subscribers “binge-watch” video, they create rapidly fluctuating demand that can result in network congestion and slow traffic. Yet Netflix ratings are now a key benchmark for internet service. So operators need to minimize the cost of delivering these high-volume applications — without compromising quality. Of course, adding capacity helps networks scale to meet demand. But as device numbers skyrocket and application usage patterns become more unpredictable, the challenge is to utilize that capacity efficiently while maintaining a great user experience. A network without real-time visibility simply can’t assess service flows at scale, end to end. Which means that operators can’t respond rapidly and cost-effectively to constant, fast-paced changes in traffic demand. This leads to higher service delivery costs, degrading user experiences, or both. Performance needs: New mission-critical, industrial-grade internet applications are highly sensitive to latency, packet loss, and round-trip delays. Internet of Things (IoT) applications for smart homes, cities, and cars may not generate as much traffic as internet video, but their value per bit is considerably higher. So network performance and delivery quality must be optimized accordingly for both high-volume and mission-critical application traffic. This emerging requirement makes network-wide, real-time visibility and control even more important for business success. Operators can’t afford to fall behind by using outdated and cumbersome polling and scripting approaches to monitor and manage network traffic, as applications grow more demanding and diverse. Security needs: Network operators are also facing one very different kind of challenge — to network security. Cyber criminals have made the cloud a tool for disrupting essential infrastructure services and compromising vulnerable assets. As a result, operators need faster, more efficient ways to identify and mitigate these distributed denial of service (DDoS) attacks. Again, real-time visibility and control can play a key role, by helping to disable threats and reroute traffic quickly. They also enhance overall security throughout the network infrastructure — not just at the perimeter. In contrast, costly probes, scrubbing centers, and laborious scripts for shutting down attacks leave many operators feeling they are always one step behind a network disruption. In brief, real-time visibility and carrier SDN control are prerequisites for making IP networks more responsive and adaptable. And real-time analytics performs a critical role in closing the loop for an insight-driven, automated operations model. As shown in Figure 1, the network collects a vast array of telemetry data. Real-time analytics allows this mass of information to be converted quickly into actionable insights, so performance, efficiency, and security issues can be remedied before they escalate. A smart network fabric provides the foundation for real-time visibility and control over resources and traffic flows at the operational level. The fabric’s enhanced packet intelligence detects and reports application flows. And that gives operators a network-wide, up-to-date view of the end-to-end data path — from internet peering points to the local access loop. Enhanced packet control capabilities allow surgical removal of malicious traffic flows to mitigate volumetric DDoS attacks, and they can also deftly steer thousands of application flows around bottlenecks or points of failure to optimize resource utilization and user experience. Then Carrier SDN WAN applications interact with the smart network fabric to provide the centralized real-time control needed for policy enforcement. This type of programmable control is increasingly important in operational-support infrastructures, ranging from service automation to resource provisioning and network optimization. It is especially well-suited for handling cloud dynamics and multivendor environments. 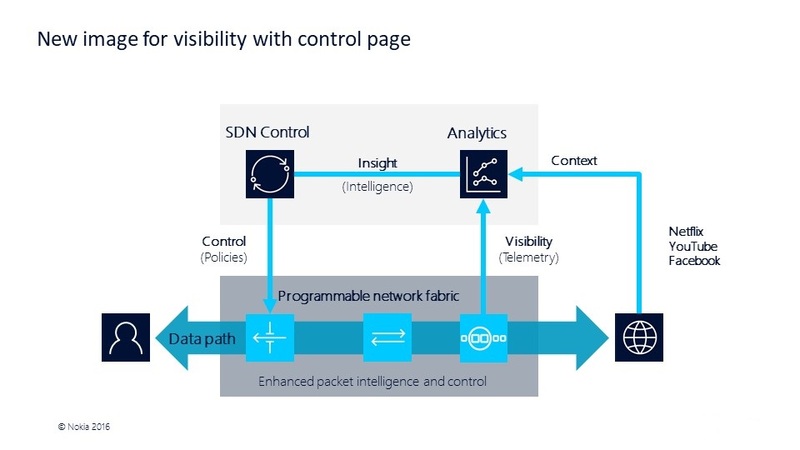 Carrier SDN platforms such as the Nokia Network Services Platform (NSP) use a wide range of legacy management and next-generation control interfaces to orchestrate the network with dynamic and adaptive control. One of the platform’s crucial tasks is translating network-wide SLA objectives, services policies, and decisions into specific control directives that can be enforced by individual network devices. For example, thousands of flows might be steered around capacity bottlenecks to relieve network congestion and preserve performance quality. Or 100,000 or more harmful flows might be filtered to mitigate a DDoS attack and protect network infrastructure and customer assets. These kinds of scenarios involve many different network devices. Therefore, advanced support-system integration and insight-driven automation are essential for fast, accurate management of the transactions — with quicker resolution of problems. Modern IP networks help bring people, businesses and industries together in the digital world of the global sharing economy. They enable humans and machines to interact instantaneously, intuitively, and securely. But this new world of interconnected systems also presents challenges. The best approach to addressing these concerns is to make the network part of the solution. Using adaptive networks with real-time visibility and control capabilities allows operators to embrace the vast scale and complexity of the cloud — because these networks provide the adaptability, scaling, and security needed for success in this new environment. To find out more about adaptive networks and insight-driven automation, please see the additional resources we have provided — including information on the new Nokia Deepfield solution.